1900 / 1900 ti - end of prod. 1900 Sprint - end of prod. 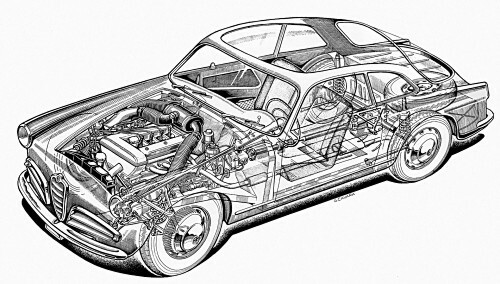 Two primal versions of the saloon 1900 and 1900 TI were end of prod.. 7611 and 572 were built retrospectively. The sport version also recieved the increased size engine. 949 were made. Only versions built by Touring (Coupé) and Pininfarina (convertible) are now sold directly by the Alfa Romeo dealer network. 6C 3000 - One of the two spiders was modified to comply with the new regulations and the engine capacity was limited to 3-liters. This car was renamed PR, Passo Ridotto (Reduced Wheelbase). 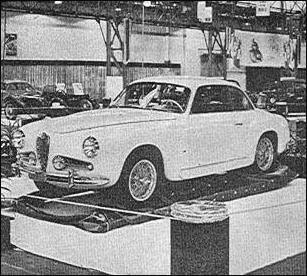 Pride of place amongst the new models must be acCorded to the new small Alfa Romeo, christened the Giulietta 1300 Sprint. The anglicized form of the name , is, of course, Juliet, and there is a new Romeo, too, this being the name given to another new Alfa model, available as a camping car on nine-seater lines, and evidently intended to compete with the similar form of the Volkswagen. Modifications in other Alfa Romeo models have also been made, the 1900 becoming the 1900 Super and the engine size being slightly increased from 1,884 to 1,975 c.c., with other minor alterations, resulting in increased power, particularly at the lower end. The bore and stroke are now 84.50 x 88 mm, and with a compression ratio of 7.5 to 1 the output is 90 b.h.p, at 5,200 r.p.m. 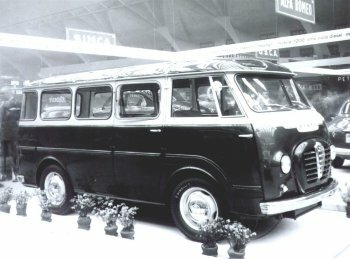 Improvements in the coachwork make for increased comfort; the facia is restyled with hooded instruments in front of the driver, a larger rear window is fitted, and the capacity of the luggage locker has been increased. Finned front brake drums are also fitted, as on the Giulietta. 1900 C (4 cyl, 1884 cm³, 100 KM) - end of prod. The Super Sprint has also received minor modifications, and the 1,975 c.c. engine with a compression ratio of 8 to 1 gives 115 b.h.p. at 5,500 r.p.m. A five speed, all indirect, gear box is fitted. A slight lowering of the front has resulted in decreased wind resistance and the maximum speed is given as 200 k.p.h. or about 126 m.p.h. 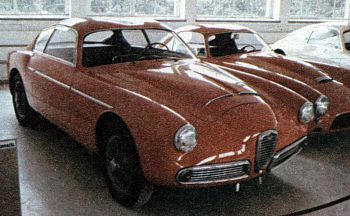 Alfa Romeo made two spiders and two Coupés using similar chassis as the C52 Disco Volante. 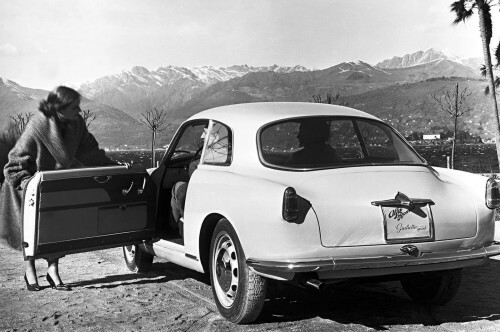 In Bertone, Franco Scaglione penned two unique aluminum bodies, a Coupé and a spider. 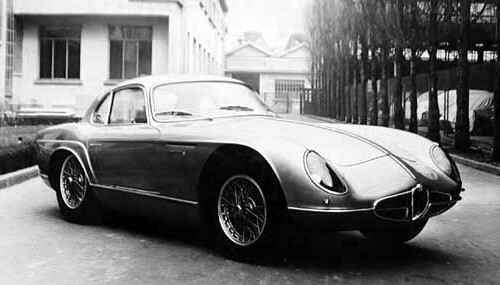 The Coupé is called 2000 Sportiva. The Spider with chassis number 19005-00003 weighs 2,000 pounds (910 kg) and has 138 horsepower. The top speed is around 137 mph (220 km/h). Alfa Romeo Giulietta 1300 Sprint with Bertone body at the Paris Motor Show. The Giulietta Sprint Coupé is the forerunner of a series saloon model to the same general specification. It enters a new field of activity for Alfa Romeo, which as a make has hitherto been confined to the high-performance class of medium size represented by the well known 1900 model. 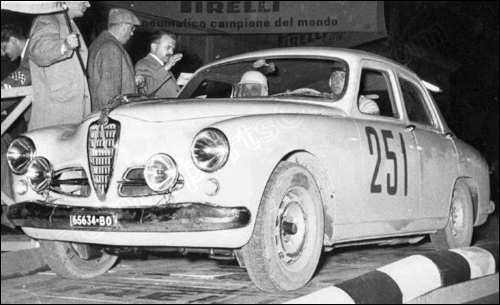 In specification the Giulietta is in the true Alfa Romeo tradition, having a twin camshaft overhead valve engine of 74 x 75 mm bore and stroke (1,290 c.c. ), with which a dry-plate clutch and four-speed all-synchromesh gear box form a unit. A two-piece propeller-shaft with intermediate bearing transmits the power to the hypoid bevel final drive of 4.55 to 1 ratio, and the rear axle casing is located by radius rods at each side and by a central triangulated member, the suspension being by coil springs and telescopic hydraulic dampers. The front independent suspension is by superimposed wishbone links and coil springs set with their axes inclined inwards. The brakes are hydraulic, with two leading shoes at the front. Bi-metal drums of large diameter are used, as on the 1900 TI, and the front drums carry numerous helicoidal fins for the better dissipation of heat. The disc wheels also are pierced to allow air to circulate freely over the drums. In appearance, too, the car is a true Alfa, with a smaller replica of the shield-shaped grille. 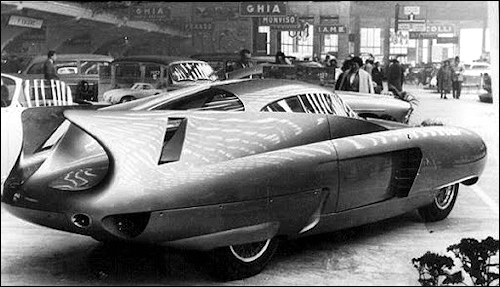 The body is of aerodynamic design and is built by Bertone and finished by Ghia. It is a sports two-seater Coupé with space behind the seats for luggage. There is also a luggage compartment in the long sloping tail, the whole of the tail panel complete with large rear window opening up on a side hinge. A handle in the trim panel on the right-hand side controls the opening of the tail, so that luggage is secure when the car is left with locked doors. Curved windscreen and rear window give excellent visibility. The door windows have winders and the quarter windows open for ventilation. A large parcel shelf is formed behind the bulkhead of the luggage platform. Instruments are grouped in three dials beneath a single cowl to prevent reflections, and include a rev counter. In view of the low drag of the body design, and the fact that the power output is 65 b.h.p. at 6,000 r.p.m. one feels able to accept the claimed performance of 160 k.p.h. or 100 m.p.h. It is also understandable why such attention has been paid to the brake cooling. As the weight is less than 16 cwt it may be expected that the acceleration will be decidedly brisk. The car's track is 4ft 2in and wheelbase 7ft 9 ¾ in. New version AR 52 for civilian market, here converted into fire engine. 154 were built. The new Romeo is interesting as a camping or estate car, because it is available with the same engine as the new Giulietta or alternatively with a two-cylinder vertical supercharged diesel two-stroke engine of 85 x 102 mm bore and stroke (1,158 c.c. ), developing 30 b.h.p, at 2,800 r.p.m., which is built under List licence. Alfa Romeo 1900 TI, chassis #07564 (Mario Fantuzzi / Duilio Fancelli) at Mille Miglia.